The Realm of Darkness has its own natural landmasses, often stone-like with blue glowing cracks in them. However, when Heartless devour a world's heart, it is swallowed into this realm and becomes connected to other worlds the Heartless attacked; although this sometimes help create new worlds like Traverse Town and End of the World. As with the Realm of Light, this realm has a Keyblade, Kingdom Key D, which chose King Mickey as its wielder. It is where Ansem, Seeker of Darkness formed the Kingdom Hearts of Worlds' Hearts, and is the home of all Pureblood Heartless. After defeating Terra-Xehanort, Aqua awakes within an immense, eerie cavern known simply as the Realm of Darkness (闇の世界, Yami no Sekai?). Starting at the cavern's Middle Zone (中層, Chūsō? ), she ventures through the Lower Zone (下層, Kasō?) and Upper Zone (上層, Jōsō?) before finally finding a way out. These caves are infested with Heartless and strange rock formations, as well as geysers and barriers formed from pure darkness. In the Upper Zone is a path towards a spiraling purple and violet light. Following this path leads to out of the cavern and to the Valley of the Dark (闇の狭間, Yami no Hazama? ), a twisted and decaying forest drenched in darkness. Past the valley is the Dark Cinderella Castle in the distance, which can be reached through a crumbling forested path sparsely lit with lanterns. Surrounding the castle is the Castle Town, which is filled with empty houses, business stalls, and a fountain frozen in time in the center. Pieces of buildings float around the area. At the edges of the Castle Town, the remains of the world are crumbling into blue crystals. Beyond that is the remains of the seven Dwarfs' cottage from Dwarf Woodlands, and a mirror leading to the World Within (鏡の中世界, Kagami no Naka no Sekai?, lit. "the World Within the Mirror") the Magic Mirror, which resembles both the realm of the Spirit of the Magic Mirror and the Queen's dungeon. Past the mirror is the Forest of Thorns (茨の森, Ibara no Mori? ), a corruption of the dark forest of Enchanted Dominion which ends at the Forbidden Mountain. From there, a portal leads to similar cavernous area known as the Depths of Darkness. At the end of the path is a sandy terrain leading into a bright light; it leads to Homecoming, where Kingdom Key D is hidden. At the furthest reaches of the Realm of Darkness, on the border between it and the Realm Between, is a moonlit shoreline called the Dark Margin (闇の海岸, Yami no Kaigan?). Like the caverns, this beach is littered with strange, almost organic rock formations. Aqua fighting Heartless in the Realm of Darkness. While wandering lost through the Realm of Darkness, Aqua is confronted by a Darkside. She prepares to fight it, but three more Darksides join the fight and she loses hope. However, she is rescued by the Earthshaker and Wayward Wind Keyblades, which make quick work of the Darksides and renew her hope. She looks at her Wayfinder and remembers all the friends she has made throughout her journey across the worlds. Smiling, Aqua vows to escape the Realm of Darkness. However, as she moves onward, a crack of light forms in the cavern's roof and a beam of darkness fires through it. Aqua's Wayfinder stops glowing and she senses something is wrong. Aqua ventures deeper in the Realm of Darkness and comes across the Heartless, enemies she does not recognize. As residents of the Realm of Darkness, these enemies prove to be stronger than the Unversed, but Aqua manages to fight her way through them until she reaches the Dark Hide. Although the beast is vicious and powerful, Aqua finally emerges victorious after a lengthy battle. Venturing forward, Aqua is horrified when she spots the destroyed Castle of Dreams jutting out of a sea of darkness in the distance. Aqua continues her journey through the Realm of Darkness, passing through the remains of Castle of Dreams, Dwarf Woodlands and Enchanted Dominion. Aqua questions what happens to the people who have lost their worlds to darkness, while finding herself thinking back to when she was with her friends. She is eventually confronted by Phantom Aqua, an illusion created from the doubt in her heart by the darkness. Once it is defeated, Aqua finds manifestations of Terra's and Ventus's hearts; Terra is able to converse with her, while Ven remains comatose. However, Xehanort attempts to use this link to find out where she hid Ven. Terra fights off Xehanort, accidentally summoning a Darkside, which pulls Aqua into darkness. Aqua is rescued by Mickey, who informs that an entire decade has passed since the battle with Xehanort. Mickey informs her they need to find Kingdom Key D, to help Sora and Riku seal the Door to Darkness to keep the Heartless from escaping and destroying the worlds. Upon finding the Keyblade they need, the duo find Demon Tide attempting to attack Riku; Aqua tethers it with her magic, getting pulled into a secluded part of the Dark Realm. Mickey is left to focus on sealing the Door and hoping to find Aqua again. Once she defeats the Heartless, Aqua rests; she is content to wait for her rescue, knowing now that the Realm of Light is safe with Sora and Riku there. When Riku continues to resist against his possession, Ansem banishes the boy's heart to the Realm of Darkness. Riku's heart manifests as his former self, lamenting over his foolishness in abandoning his home and friends all for the sake of dark power. He hears Mickey call out for his help. Mickey lets him know that he has retrieved a Keyblade of darkness, with which they can close the Door to Darkness. Riku agrees to help, and continues onward to find the door. Later, after Sora reaches the deepest depths of the End of the World, he finds Ansem preparing to open the Door to Darkness, so that he can enter the Realm of Darkness and the Kingdom Hearts of Worlds' Hearts laying within it. Though Sora defeats Ansem, the door has already opened and darkness begins spilling out. As Sora and his friends struggle to shut the door, they see Mickey and a restored Riku on the other side, and together, they manage to close the door. Riku awakens from his slumber in the Realm of Darkness when an unseen presence, later revealed to be DiZ, gifts him a magic world card and asks him to choose between slipping back into sleep, or taking the card and making his way toward the truth. Riku decides that going back to sleep would be boring, and confidently takes the card. He is taken by the card through a corridor of darkness to the lowest basement of Castle Oblivion. As Riku makes his way through the castle, he is contacted by Mickey, who is still trapped within the Realm of Darkness, but encourages Riku to persevere. As Riku reaches the top of the castle, Mickey finally finds a way out of the Realm of Darkness in the form of another card, which showed him Riku's heart and led him through a corridor of darkness constructed by Organization XIII. After running into Mickey at Twilight Town, Sora and his friends decide that they must enter the Realm of Darkness to find Riku. When they encounter Saïx at the Battle of the 1000 Heartless, Sora even begs Saïx to let him into the Realm of Darkness, but the Nobody coldly refuses and prepares to attack. Maleficent begrudgingly rescues Sora and his friends by transporting them to the Realm of Darkness, where they run into a disguised Riku-Ansem. He leaves them a sea-salt ice cream bar and a photo of Roxas in Twilight Town as clues to get to The World That Never Was, rescue Kairi and destroy Organization XIII. They follow the clues to the Old Mansion, hoping that the Simulated Twilight Town will have another path to the Realm of Darkness. After defeating Xemnas within his "The World of Nothing", Sora and Riku end up at the Realm Between's side of the Dark Margin. They patiently wait there until Kairi's Letter washes up on the shore. The Door to Light appears as they read it, allowing them to return home to Destiny Islands. Eventually, Aqua finds Ansem the Wise sitting on the coast of the side of darkness, having been sent there by the explosion of the Kingdom Hearts Encoder, though he is slowly losing his memories again. Aqua and Ansem have a conversation about the worlds and how Ansem came to know Sora. This leads Aqua to shed tears of hope and say Sora's name, knowing that he will save her and her friends. 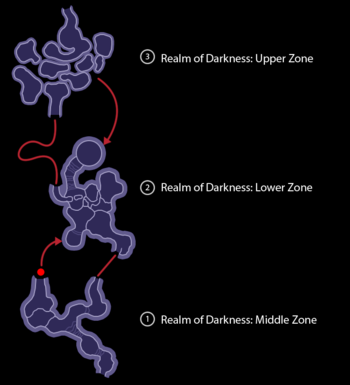 According to the Director's Secret Report XIII, the Dark Margin is the tip of a world in the Realm Between reaching into the Realm of Darkness. The Kingdom Hearts II game files and the official Kingdom Hearts website refer to this world as End of Sea (エンド・オブ・シー, Endo obu Shī?). ↑ Director's Secret Report XIII, p. 27-28; Interviewer: "Is there a possibility that blank points in time and settings that haven't been shown in detail such as the "Realm of Darkness" etc will be depicted in the future? Was the beach that appeared at the beginning and end of KHII the "Realm of Darkness"?" / Tetsuya Nomura: "At present, I think there are four broad stories you could say are blank: "King Mickey's period of absence", "Riku's period of absence", "Roxas's days with Organization XIII", and "Xehanort's past". In that case, "King Mickey's time of absence" would be a story set in the Realm of Darkness. I have been considering over and over how I ought to tell these four stories, so perhaps someday they will be told in some way. That place that appears at the beginning and end of KHII, called the Dark Margin, is the tip of the cape of that world, and it is not strictly part of the Realm of Darkness but a boundary-like place between Darkness and Between. This means that in the ending Sora and Riku are looking at an ocean in the Realm of Darkness from a beach in the Realm Between. This also means that the scene of the door appearing in the ocean of darkness at the end was symbolic of Sora's "deep down, there's a light that never goes out" line from the first game." Translation via Goldpanner.